View from the front, warp chains threaded through the reed. “How long does it take to weave that? It’s a common question I hear. So, do you want the long answer or the short answer? I have tried to time projects just to get a better idea on how to answer, but where do I start? 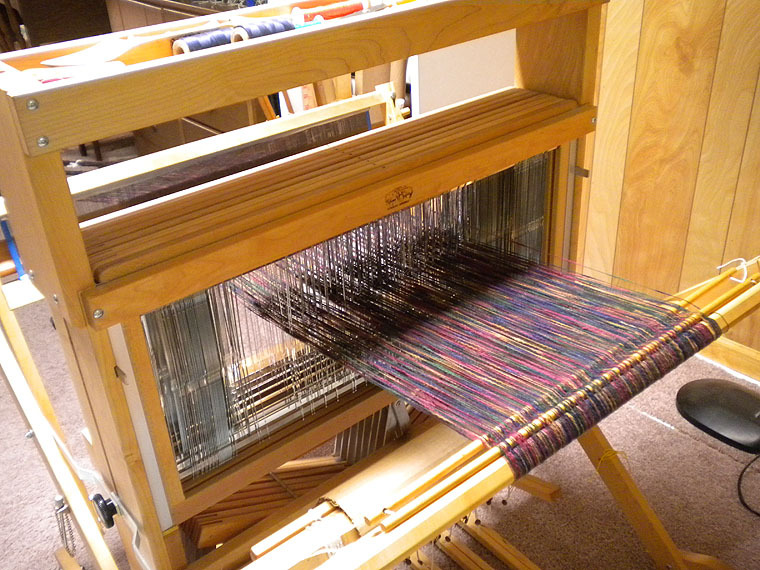 The seed for each warp often springs from an earlier project. As I weave, I consider how I could choose a slightly different colorway or wonder what would happen if I treadle this threading as if it were a different structure entirely, weaving an overshot as if it were a lace weave for instance. So the planning is sort of fluid and therefore, hard to “time.” Putting it into an actual planning sheet doesn’t take long in itself, but my indecision can really take a while to ferment into a cohesive plan. View from the back of the threads coming through the reed and the heddles. Once at the loom, every thread has to go through the reed and a heddle—in the right order! Sleying the reed usually doesn’t take as long, typically about an hour or so, again depending on the fineness of the threads and how many go through each dent (slot). Threading the heddles, though, can take the better part of a day and half. Not as young as I used to be and I have to get up and stretch more often. 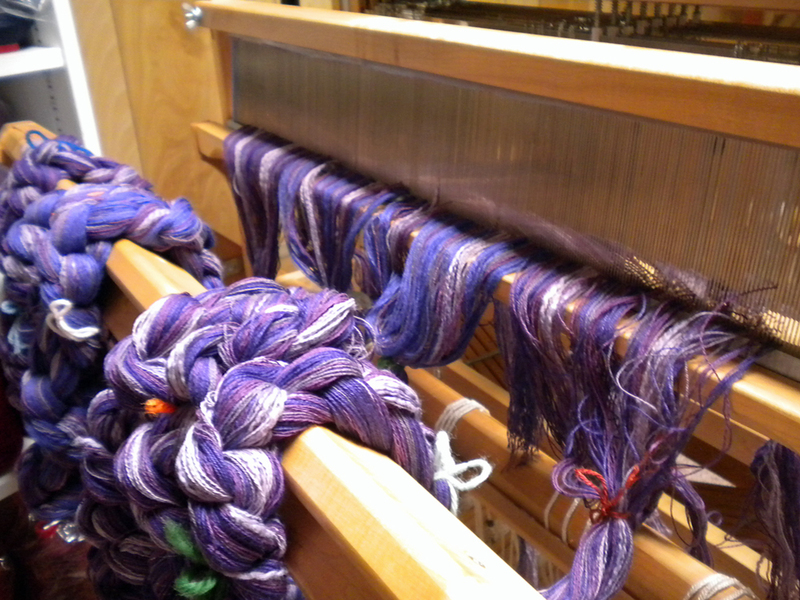 After the warp is threaded, it has to be wound onto the warp beam. Here is where I find out if I’ve inadvertently crossed any threads between the reed and the heddles. 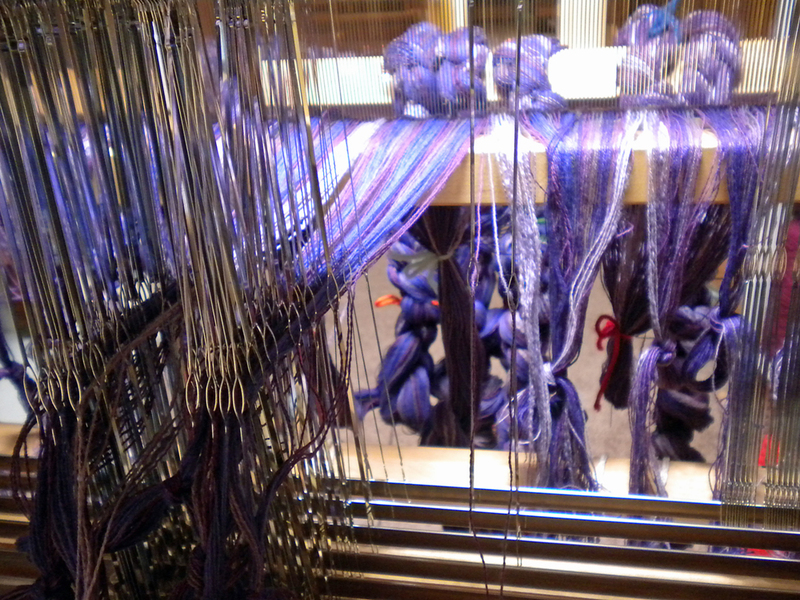 If I don’t have tangles, the winding on goes pretty quickly—about an hour or so, depending on the length of the warp. After I tie it onto the breast beam, spread the warp, and adjust the tension, I’m ready to weave. This is the fun part. There is a value in the connection between the hand and the product. We’ve gotten so far away of an item’s source that we don’t care about it anymore. But if we know that a person took the time to choose the colors and plan how those threads will cross, will we not see that cloth in a different light? Will we not appreciate that item more and elevate the task it’s used in to be more than it was? Whether it’s a handmade quilt, or homemade jam, or handspun yarn, or handwoven towel, it’s the “hand-“ and the “home-“ that make those items more valuable because someone took the time. Besides I love to weave. How long does it take you to do what you love?